This comprehensive and easy-to-follow course by a Top L.A. Session bassist and Berklee Graduate will show you how to blow audiences away by creating solo bass arrangements and playing bass like a piano! For less than the price of a private lesson, you will learn tricks and techniques that you literally cannot learn anywhere else! People will be BLOWN AWAY when they see you playing like this! The course is an instant digital download. A download link will be emailed to you immediately after payment. Tutorial of 3 solo bass arrangements with TAB and Standard Notation to get you started in playing this style immediately! So you’ve probably seen my videos on YouTube where I arrange entire songs for bass and play the chords, baseline and melody together to create an arrangement that stands out on its own. I’ve always been a fan of players like Victor Wooten and Michael Manring who are famous for this style of playing, but it wasn’t until an event that took place in my late-teens that I really started to explore this side of bass playing. I was playing bass in the orchestra pit of a musical and had a huge crush on one of the actors in the play. One day I finally got up the courage to go up and talk to her. We started talking about music and she said something that broke my heart and that I will never forget... She said "I really want to learn guitar... Bass is too boring, it's just one note at a time". If only I knew back then what I know now.. I could've blown her away with a solo bass arrangement and showed her how amazing the bass really is! This set me on the path to learning and mastering solo bass and I never looked back! The problem with learning this style of playing is that there is very little information available out there. There is no instructional material, and most of the guys playing like this are not giving away their secrets. Most of the instructional material you’ll find is geared towards more formal education and the role of the bass in a band context. You can learn how to play jazz, create walking bass lines, solo over changes, play rock, etc. But if you’re looking to take a piano song and play it on bass with unconventional technique… you’re on your own. As I thought about my struggle and the amount of time and money that it took me to learn this stuff and figure it all out, I realized there are probably many other people out there going through the same struggle. Like you, reading this right now. Maybe you’re fascinated with this style of playing. Maybe you’ve had someone tell you bass is boring and you want to prove them wrong. Maybe you want to serenade that special girl and play her favorite song (which I have done in the past to great success! They love this stuff). Whatever the reason, I decided to lay it all out and teach you all the tools I use and what process I go through to create these arrangements. You literally cannot find a private instructor that will teach you this stuff… because most people DO NOT know anything about it! And if you do find someone who can teach it to you, I guarantee they will charge you a fortune. 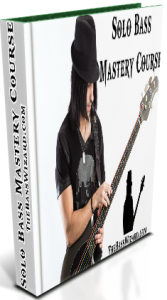 I’m offering this comprehensive course at an extremely affordable price because I want to let the secrets out and feel that every bass player out there deserves to learn this stuff. So if you’re ready to literally blow people away and show them something they’ve never seen before, you’re in the right place. Buy now before I decide that these secrets are just too good to share with the world and take it all down!